August felt more like September in the Northeast. And September may feel more like summer with my daughter not starting 1st grade until September 15th [yes, an anomaly; it's due to construction on the high school which affects the school system buses...]. But, with Labor Day weekend happening as I write this, I have my excuse to be retrospective and share with you The Carpetology Blog Roundup for August, 2008! August was all about the 2008 Beijing Olympics which we covered in Carpet At The 2008 Beijing Summer Olympic Games and Olympic Carpet Recap. Amazing to witness carpet as the critical and supportive backdrop to gymnastics in particular, and as the opening ceremonies creative surface. Two posts offered more perspective on Wear-Dated [see About Us: What Is Wear-Dated?] and the tools available on the Wear-Dated website. If you are looking for a useful tool for retail salespeople to offer carpet shoppers, suggest that they read "Before You Buy Carpet, Download This Show Me Sheet". If fact, the "Show Me Sheet" is what Elizabeth used as she proceeded to the next step of The Carpetology Guide to Buying Carpet - Step 3: shopping. Design, particularly in flooring, matters to consumers and carpet buyers. In Inspiration From NeoCon, Ann Hurley talks with Kim Gavin about carpet style trends. We introduce a new monthly series about design in Design Reviews From the Floor Up ~ Design*Sponge and count on Sonna Calandrino to showcase Fabulous Floors & Fabulous Carpet Styles! Possibly the most inspiring summer carpet takes place every other year in Brussels. We capture the highlights in Brussels Flower Carpet 2008. Carpet has been in the news with Carpet Works In Amazing Ways and Carpet For Your Tent, Carpet For Your Cubicle. And, I'm very pleased to report that our woman won [see Support Your Local Red Carpet Reporter!]. I'll have more details on that early next week. Two new episodes of A Foot's Perspective, both taking place in Nashville, TN, site of the Summer 2008 Carpet One Floor & Home Convention. A Foot's Perspective - Episode 10 exposes you to Millennium Nouveau in Gerber Daisy pink, and A Foot's Perspective - Episode 11 talks Wear-Dated Natural Nylon. Finally, you have something to look forward to with Fabulous Floors' Fabulous Find: Color. You'll be hearing more about that, too. Have a wonderful Labor Day and last August Weekend! She Is Woman, Hear Her Floor! Shopping Formation Display Team originally uploaded by About tricky™. Too often in the flooring industry the [woman] consumer isn't given her due - particularly at retail. So, it's delicious to encounter perspectives that passionately promote how best to market to this consumer, as I have here. A two part series in National Floor Trends by Patricia Flavin, senior vice president of marketing for Beaulieu of America, a carpet mill, titled "I Am Woman, Hear Me Floor" instantly caught my attention and inspired this post. Part I speaks directly to flooring retail salespeople - many [maybe even most] are men - offering advice for selling to women. - Women are wired differently: we pay attention to all of the details. "Women's brains are more like spaghetti - a twisting, interwoven and relational stream of facts, interpretations, intuitions, comparisons and emotions..."
- Women raise shopping to an art form: our search for 'the perfect answer' [to use Marti Barletta's expression] means that we are relentless in our shopping. Our expectations are extremely high. Exceed those expectations and you will reap rewards with all of your customers - women and men! - Women are shopping online more than ever. Oh, yes. If you don't believe this, read Marketing to Women Online. Online is available 24/7 allowing her to research and shop on her time, when it's convenient for her. Make sure, then, that your online and offline experiences match up and are "consistently female friendly." - Women are in a hurry. In the 7 New Rules for Marketing to Women, rule #2 was Finding More Time. Here, Flavin brings up shop-at-home services [read Jon Trivers - How To Create Your Own Flooring Empire] for "perceived time-saving convenience and immediate gratification of next-day installation." - Avoid "Pink Thinking." In other words, beware of stereotyping women. Focus instead on offering the best service possible in the most "simple, shopper-friendly presentation that feels warm and inviting" possible. - Be master of the Web-to-store cycle. This goes back to women being online now more than ever. "Women respond to websites that are easy to navigate and excite her with decorating ideas and possibilities." Part II relates these rules of selling to women to Flavin's own experience selling her own line of skincare essentials and botanicals on a home shopping network for 17 years. - Don't keep her waiting. "The waiting time is by far the single most important factor affecting her opinion of your service." - Be an environmentalist: create a store environment that engages customers and draws them into your store. One that helps tell a story about you, your store and your products. - Listen, then speak. Don't start showing her product until you've listened carefully to her story, to what she's trying to create. Lis Calandrino says she's not buying product, she's buying solutions. The better you listen and understand her life story, the better you'll be able to establish a relationship of trust and respect and multiple transactions. - Give her space. The more space a woman has to shop a flooring store, the more likely she is to relax, spend time, browse and eventually buy. The more cramped [and cluttered] your store, the less likely she is to even enter, let alone buy. - Guys are a bonus. Create a retail store experience that successfully appeals to women, and it will also appeal to men. There is no-downside. Flavin refers to Lisa Johnson's and Andrea Learned's book Don't Think Pink: What Really Makes Women Buy -- and How to Increase Your Share of This Crucial Market. I also recommend Andrea Learned's e-book titled Marketing to Women for the Common Man, and Andrea's most recent post in MarketingProfs Daily Fix Walking Like a Man (But Buying Like a Woman). These resources will give you much to think about as you reconsider your retail experience from your customer's perspective. BTW, I'll be meeting Patricia in September and anticipate a spirited discussion. That Marketing To Women... Online event I recently attended brought back memories. Memories of the first major marketing to women event I attended: the inaugural Marketing To Women Conference - M2W - in Chicago in April 2005. And Fara Warner, business journalist and author of The Power of the Purse: How Smart Businesses Are Adapting to the World's Most Important Consumers-Women. And, also Lori Bitter from JWT Boom - who turned me onto David Wolfe and Ageless Marketing: Strategies for Reaching the Hearts and Minds of the New Customer Majority. I also got to hear Grant Schneider - CMO Time Inc. and author of She Means Business: 7 New Rules for Marketing to Today's Woman. He shared with us a early copy of the book, titled then "Seven New Rules of the Road: Understanding Today's Woman," published in 2004 and based on research from Time Inc.'s Women's Group publications and involving over 30,000 American women. 1. Keeping your balance - Still very true. "In seeking balance, rejecting the notion that they must makes 'either/or' choices in their lives, women are also rejecting the idea that life is a zero-sum game, where spending time on a career necessarily means being less involved at home. Instead of finding that one choice replaces another, one choice can enhance another..." In fact, this reminded me of the article that Thomas P. Woerner, Brandweek publisher, started off the Marketing To Women Online session with [by Becky Ebenkamp, titled "The Post Soccer Mom"] that states "balance is the new four-letter word." 2. Finding more time - Definitely still true. I feel breathless for more time. I'm tremendously proud that I'm able to handle at least four times more than I was doing four years ago [and it's not as if I was slacking off then], but also impressed with how little time -wiggle-room I now have to deal with unexpected developments. According to DYG Inc., when asked to "choose between gaining additional moderate amounts of time or of money, [women] picked more time by nearly two to one." This chapter also addresses the The Paradox of Choice: Why More Is Less [a topic I address in Are There Too Many Choices?, The Problem With Too Many Choices - And The Opportunities, A Transcultural Perspective On The Retail Experience, Musings on Choice, Culture and the Retail Experience, and Lost in the Supermarket]. According to psychologist Susan Sugarman "humans as a species are not biologically equipped for the large number of choices we currently face." That explains a lot! The perfect solution, then, to finding more time and dealing with the stress of too many choices is to consult others whom we trust. Schneider here mentions doctors and other moms. The marketing to women online seminar touched on community and virtual boards of directors. In a retail environment, it becomes a function of how we edit, package, merchandise and accessorize our product recommendations, and offer online resources for gathering information. 3. Feeling optimistic - This chapter explores the benefits associated with optimism. Fascinating and -for me- uplifting and inspiring as "an optimistic outlook is a trait common to women of all ethnic backgrounds and age groups." Real Simple magazine "found that women generally express high levels of confidence in the direction their lives are moving and in their ability to make choices that best meet their needs." 4. Earning trust - even truer now than it was then, and it was important then! Trust is what helps us save time and make better decisions. The sources we trust are reliable and authentic and tell the truth. They care about us, they listen to us, their insight is relevant to us, they don't try to do a hard sell on us. That's what makes word-of-mouth endorsements so believable. For a retailer, that means embracing what Faith Popcorn describes as "anticipatory marketing... [which] requires having enough insight into a woman's life to fulfill her future needs without having to ask her for a blueprint." It also means "taking the needs of women into account when designing the physical shopping environment, adapting it to reflect the desires of women customers, not waiting for women to identify problems or trouble spots." 5. Expressing yourself - this rule combines trading up, treasure hunting, our delight in design [i.e., think what Target has promoted with 'cheap chic'], and our willingness to express our own inner creative diva. "Today, there's an emotional connection with style - it's the thing that moves women to buy. Purchases are less about conspicuous consumption and keeping up with the Joneses and more about how they make women feel, the emotional reward." At the same time, the purchase must embody value and quality. 6. Feeling in control - Women want to feel in control of what they buy, do, select.... "Feeling in control is integral to a woman's overall sense of well-being, extending far beyond her psychological health and directly affecting many aspects of her physical health. We live in a hectic and often confusing world where much seems beyond our control, so it is little wonder that women are looking for practical help in areas of their lives where they can exert real influence." 7. Connecting with friends and family - to relieve stress, to learn, to recharge, for grounding and for validation. The home is considered the "emotional center for connecting with family and friends." Furthermore, "we are creating and sustaining our homes in new ways, discovering emotional links between the abstract idea of 'home' and the material things it contains." No surprise, then, to realize how important Web 2.0 has become in enabling the Age of Conversation, and even more connecting. And how important online tools like ratings and reviews and social networks are for enhancing connection, finding time, helping make sense of choices, feeling in control, supporting balance, generating optimism and earning trust. Read the book for yourself and let me know how relevant you find the 7 new rules for marketing to women. I'm willing to bet you will be surprised and delighted. Please, Will You Review Our Groundswell Entry? My Forrester Groundswell Awards Submission has been accepted and is now posted. It is ready for your reviews. Here's a screen shot of the page we appear on. See, The Carpetology Blog is the entry in the middle. You can even see The Women of Wear-Dated! We are in good company with Acuvue Wink and Johnson & Johnson health channel [YouTube]. Please, will you visit Forrester Groundswell Awards: Talking and add your review? Particularly to The Carpetology Blog entry? And, will you let others know so they can add their reviews? After all, we are the groundswell! Thank you, too, for the inspiration to be involved in all of this. I believe completely in the groundswell. I am part of it as are all of you reading, commenting, reviewing, searching, posting photos and connecting. We all belong to a new world order. For that reason, I have decided - after reading Josh Bernoff's blogpost titled "now accepting entries for the Forrester Groundswell Awards" - to submit an entry to the Forrester Groundswell Awards. In fact, this blogpost is my official submission page. Starting around August 19, Forrester will publish the submissions in the Awards section of the Groundswell website. That's when you can add comments and vote, and get even more immersed in the groundswell! I'll let you know when -and if- my entry gets posted. Description of this entry: The Carpetology Blog represents a consumer focused weblog focused on all things carpet related. This includes carpet design ideas, color inspiration, trends, practical advice on how to buy and care for carpet, what to look for in carpet, the differences between one carpet style and another... We also include humour, stories about carpet in the news, preposterous tales involving carpet, even art, culture and carpet. Our goal is to help make sense out of all of the information available about carpet, carpet buying and carpet care, in a category that is generally unpleasant to shop for, where the emphasis in-store is on commodity and low prices rather than fashion, style and experience, and where salespeople often don't give the core carpet-buying consumer [a woman 85-90% of the time] credit for making purchase decisions. Carpet buying has been compared to buying a used car. The Carpetology Blog aims to change that perception and elevate the category. 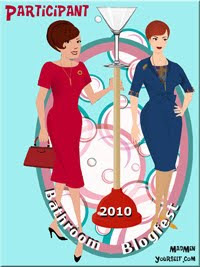 The Carpetology Blog is written by the Women of Wear-Dated who are passionate about talking about carpet. We have been in the shoes of the carpet-buying consumer and we want to make things easier and more fun. We want to engage with her as she begins to learn about carpet. Our primary carpet-buying audience consists of women between the ages of 25 to 55 who tend to be in the complex market for flooring and carpet every 7 to 10 years. From the Groundswell site and the Social Technographics Profile Tool, women in this category index high as spectators [Age 25 to 34 = 121; 35 to 44 = 116; 45-54 = 81]. Spectators, to use the Groundswell definition, "consume social content including blogs, user-generated video, podcasts, forums, or reviews." 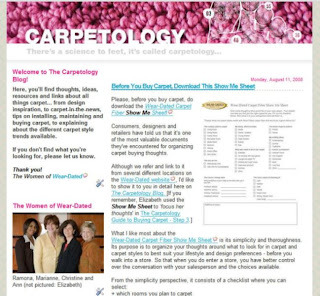 We launched the Carpetology Blog in late 2007 in anticipation of the June 1, 2008 launch of our redesigned groundswell-friendly Wear-Dated website. It incorporates social tools for sharing pages, invites comments and rankings of products and retailers and offers robust search. The Carpetology Blog enables us to talk about the carpet content on our website while bringing in other perspectives, or late breaking news and developments relating to carpet. It also means that we can describe and promote the social features of the Wear-Dated website. Since launching The Carpetology Blog, we have introduced a web video series titled "A Foot's Perspective," [visit our channel on YouTube] relating to the premise of our marketing materials that take a foot's perspective on carpet, with new episodes airing every other Wednesday. We also have Wear-Dated related photos on Flickr. + With consumers via robust and relevant carpet related content that promotes fashion, style and performance in carpet [#1 search result in Google for carpet style trends with Wear-Dated in #3 spot] and represents editorial quality information to guide consumers as they purchase or maintain carpet. + With B2B partners [carpet mills and retailers] by showcasing those who offer better retail experiences [e.g., Lewis Floor & Home, Kerns Carpet One Floor & Home], offer stylish carpet [e.g., Carpet One Floor & Home, Flooring America], create beautiful carpet styles [e.g., Mohawk, Fabrica, Tuftex] and support wonderful causes meaningful to our core consumer [e.g., Karastan]. + Extrapolating for the full year, we conservatively expect a total of 31,300 daily page views. From Technorati, The Carpetology Blog has the following: Authority of 13, rank of 524,130 and 138 blog reactions. - The costs associated with The Carpetology Blog are sunk. The Women of Wear-Dated [including Elizabeth Hise from Hughes] write, research and edit all of our posts ourselves. We tap existing talent within the Solutia, Wear-Dated [and Ultron] organizations and within the industry. Our blogging platform - Blogger - is free. Advertising value, word-of-mouth value, focus group cost estimates taken from page 113 of Groundswell. Editorial and PR values represent conservative SWAGs. Advertising, PR, Editorial, W-O-M values are based only on results through 8/11/08. It would not be unreasonable to expect those to be higher by year end. + Increased awareness of our Ultron carpet fiber business, programs and people. + Support value: better educating consumers about how best to care for carpet; may reduce warranty claim instances. + Generating more conversation with retailers about the carpet retail experience; promoting fashion, style and color to carpet consumers [vs. selling on price as a commodity product]; addressing carpet maintenance as a means to strengthening the relationship with customers. + Pass-along value of articles reprinted and distributed within retail stores. + The existence of digital content the elevates the carpet category for consumers, and has nothing to do with low end, poor quality, price-focused, hard sell and lack of authenticity. We have posted 86 stories and received 27 comments. This does not include comments received via email, feedback received at trade shows or conversations held with customers. Putting carpet into perspective: as mentioned earlier, consumers enter the carpet flooring market every 7 to 10 years. Once they have made their purchase, the experience tends to fade from memory. As consumers, we may absolutely adore what we have underfoot, and it may do an awesome job complementing our stylish interior, but most of us don't go around actively thinking or talking or writing about the specific product we chose once it is installed - unless we have problems. Carpet is a relatively low search category. Out of an estimated 308.4 million daily searches, Wordtracker estimates that 'carpet' appears 1190 times [vs. 'iPhone' at 8180]. Also, getting back to the Forrester Social Technographics Profile, our core consumer ranks high as a Spectator, which means she reads blogs, but may not be commenting on blogs. However, we do hope to engage her Critic side via the Wear-Dated website! The Age of Conversation 2 - Why Don't They Get It? will be happening very soon. Drew McLellan and Gavin Heaton are neck-deep in final proofs. They anticipate that the book will be available for sale toward the end of September. David Armano has once again designed the cover as Drew announced in Age of Conversation 2008 cover unveiled! Here it is. Isn't it beautiful? 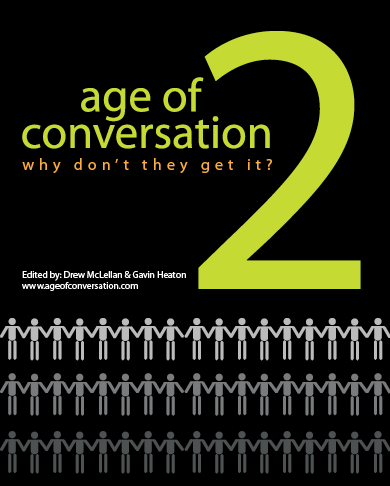 Unlike last year when LuLu.com printed our first Age of Conversation books, this year we will be selling Age of Conversation 2 through Amazon. The book proceeds will still benefit Variety, the children's charity. I'm very excited that Age of Conversation 2 is so close to meeting the world. You can definitely count on more news shortly as I can't wait to dive into my copy! The Age of Conversation - Why Don't They Get It? I'm happy to share with you Part II of A Wear-Dated Website Conversation With Integrity's John Simanowitz - Integrity Corporation having developed our website and John Simanowitz being Integrity's principal - during which we highlight what makes the redesigned Wear-Dated site unusual. In Part I, I explained that with the launch our real journey was beginning. The new website allows the Wear-Dated brand to start participating in conversational marketing - with relevant tools and information to bring beauty, comfort and durability home, by connecting shoppers to retailers who value women consumers and their long term loyalty, and through the latest advice on how to best care for and maintain carpet investments over time. Part I described what makes the new website different from the previous one, and why those differences matter. Part II focuses on the social web, the benefit it represents for corporations and the importance of online social functionality. CB: John, would you explain what role the social web plays for corporations? John: At its core, the social web is about building connections with individuals or groups that share common interests. Those common interests can range from the practical to the leisurely, but all relate to those who engage in the conversation. Playing an active part in these conversations can be extremely beneficial to large corporations, organizations and institutions. Engaging customers in meaningful online exchanges (rather than the traditional marketing monologue) means that corporations can gain valuable insights into their image, messaging and products, while dramatically increasing online visibility and generating authentic brand goodwill. Of course, success in these waters takes some navigation. When used correctly, corporations can share ideas and build customer relationships in ways never before possible. When used incorrectly (i.e.,: deceptively), this media can be your undoing. The frontier of corporate social media is an exciting one. If you sell a product or service, find a guide and start exploring at the pace that best suits you. You won’t regret it. CB: What is so important about online social functionality? John: If you remember from Part I, I mentioned that websites like Google and Amazon have forever changed buyer behavior. When faced with a large or complex buying decision, customers routinely conduct online research to determine exactly what they need, how much is fair to pay and from whom they should get it. The more complicated the category, the more important it is to offer a robust online experience. The current online experience represents a dramatic shift in power from large corporations to consumers. No longer does big business tell consumers what they think they should know. The web offers a limitless supply of information and peer collaboration, creating an audience that is not easily deceived. Should a corporation succeed in a temporary deception, the collective online backlash could be more than a brand can survive. Online social functionality means that the following matter as they have never before: Truth. Transparency. Collaboration. Observation. The brands of the future are the brands of the people. 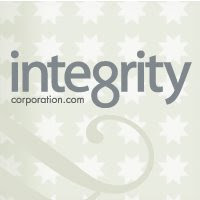 Integrity Corporation [tel: 1-314-727-3600] is now located at 6321 Clayton Road, Saint Louis, Missouri, 63117. In John's words, "Integrity is an interactive marketing agency. Integrity is a way of doing business.We bring new ideas and techniques to traditional marketing challenges. We collaborate with large organizations to identify their opportunities for growth, and architect communication strategies that hit the mark.We are passionate strategists, creatives, and technologists armed with fresh perspectives on the fundamentals of multi-channel marketing." And, thank you for visiting the newly redesigned Wear-Dated website. I welcome you to our journey. Women are increasingly online - connecting, gathering information, offering and reading referrals, and purchasing. Women are the majority of Internet users, and, yet, many savvy marketers haven't figured out how best to reach her online or even how marketing to women online works. 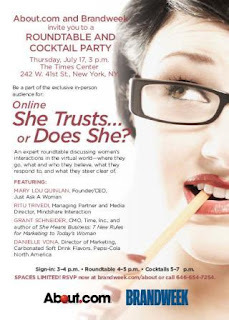 So, when Grok.com's Holly Buchanan -also author of The Soccer Mom Myth - posted about a Marketing to Women Event in NYC titled "Online She Trusts... or Does She? ", I followed up immediately. Thomas P. Woerner, Brandweek publisher, moderated. Peter Weingard from About.com started out the event reminding the audience that women dominate use of the web to manage their lives. At the same time women are no longer as easy to segment and reach. Woerner referred to an article from 6/23/08 by Becky Ebenkamp titled "The Post Soccer Mom" that describes how technology has become a tool of empowerment for young moms [NOTE: I suggest it affects all moms, not just young ones]. Says the article: "Not only have tech tools and the Internet changed how young moms live, they've changed what they expect from marketers in terms of content, delivery and even product development." The article discusses how important community is, but the community - or tribe - can be virtual, made up of relative strangers offering relevant advice and perspective. Balancing life's demands is less relevant than actively integrating them. As it relates to traditional marketers, "you do not, in fact, woo her; you invite and engage her. Young mothers expect to be partners, not merely shoppers." Which means that "by necessity and expectation,... marketers have learned to adopt more participatory structures to their initiatives, which has made the once closed, secretive world of advertising newly transparent," creating communities [e.g., Whirlpool Mother of Invention grant program] and other opportunities to build relationships with women end users. Against this backdrop, the roundtable discussion began. Quinlan explained that women look to their board of directors for advice and information. That board is becoming a digital age tribe where she may not 'know' the individuals, but the commonality of experience makes for trustworthiness. It's comparable to getting advice from across the picket fence of yesteryear, or the kitchen table. That advice helps her make sense in a relevant way of all of the content and options available. Women -as voracious researchers- like being the go-to person for information or advice. Note the rise of the citizen researcher or the "human hyper link." Pepsi's Vona said with the Tava launch that demographics were no longer relevant. Successfully connecting had more to do identifying social/psychographic characteristics and passions/insights, and delivering on expectations. It's critical to be relevant and understand what consumers' passion points are. Give them a reason to take part in the experience. What is the culture that surrounds her? Tava found that self improvement, self-fulfillment, family, entertainment and connection with others mattered. And, then, going to where she is rather than having her come to them. Schneider said that Times has retooled its sites to offer more community because that is so important to women. The content has been designed for the needs state of the specific target group. Women are sharers and any technology that a site uses to enable sharing has to be credible and useful. It's about her and her life, not about the marketer. Trivedi described an innovative digital format Suave/Sprint used called In the motherhood, a web series. Powerful and successful because it was based on consumer insight. Women don't want to be talked to, but they do want to participate and hear from other moms. The series is about moms for moms, with moms developing the content. She then brought the content back to moms with increased entertainment value. It has just been picked up by ABC as a series. Success is about listening and gaining insights from what you hear. You need to figure out how to bring women value and invite them into the conversation. The series includes LOL content, all user generated then professionally redone. Note that, in the web series, the brands are in the background. The brands talk in more traditional way via other platforms. Per Schneider, women care about whether they can trust. That means offering them content in a contextual way. Context adds to credibility. Lifestyle issues associated with a brand are relevant [e.g., parenthood and the Huggies Baby Network or the J&J baby.com] and any tools that provide meaning to that life stage increases the likelihood that a visitor will return. Vona explained that he brand has to be authentic, it also has to have a reason to be associated with the content message. Pepsi has used platforms like music [see the Tava site] to offer relevance via downloads in rich media. These deliver an experience where she is and then, if she attends an experience event, she will encounter those same artists. Quinlan described two great sites for women over 4o - Bikinis and Bifocals and Red Hot Mamas - that use humour to counteract many women's anxiety about life stages. It's no longer about mass communications. Vona made an important point about audiences. This is no longer the age of mass communications. You have to be specific about who you want to talk to and then decide how to talk to and capture her attention. But, in looking at how to communicate, it's critical to take an "ecosystem" approach and consider all avenues and channels. Online will continue to grow as content gets more credible and useful. Marketing is no longer having a monologue with customers. Rather, it's a dialog with our most important customers, women. We must be marketing with women in an honest, authentic way. Is there a difference between how men and women approach online? It gets very personal for women as they look for signals that say authentic and credible. Woman want practical and relevant information. They can spot phoniness. They don't necessarily believe all of the positive information and want to read the negatives so they can put the feedback into perspective. Men will look for the specifics of technology. People Magazine research discovered that women first look for trust and personal experience [i.e., relevance] whereas men look for expertise/authority. It has to be relevant, meaningful and consistent. Marketing to women online resembles marketing to women in the real world, in your store, and via written communications in that the message has to be relevant to her and her life. It has to be meaningful and it had better be consistent. She's looking to develop a relationship with you so you had better stick around and be available to answer questions and be there when she needs you. And, if you're smart, you'll figure out a way to involve her in what you do. That is the best way to ensure that your brand remains meaningful to her and adds value to her life. Listen to her. Observe her as she integrates her many roles, and you'll figure out how best to market with her. You can watch the event in its entirety by clicking on this link and registering [free] with Nielsen Business Media's Webcast of the event. My week in Nashville, TN for the Carpet One Floor & Home Convention [and Flooring America/Flooring Canada] energized me to no end. It must have been the hot Gerber Daisy pink Millennium Nouveau carpet [yes, made with Wear-Dated carpet fiber] in our booth. I could feel it infusing me with energy. Seriously, color makes a difference - in attitude, in conversation, in retail experience. And, yet, so many are uncomfortable with color - thinking about it, talking about it, even asking questions about it. That came up repeatedly - particularly from several men store owners - in my two Education Day presentations titled "Color Me Beautiful: Let Color Be Your Guide To Sales Success." Color is at the heart of our consumer's decisions about how to make her home beautiful, fashionable, inspiring, engaging, relaxing and very personal. And, yet, too often the experience we offer our consumer in our stores has nothing to do with that expression of self. Instead, it has all to do about our discomfort with what we can't talk about, and our distrust of fashion. It becomes about us, rather than about her - the woman consumer, our customer. The end result: a sea of uninspiring beige underfoot, and a lukewarm reaction to our retail experience. That's the funny thing. If we take ourselves - our tastes and preferences - out of the picture, it becomes a whole lot easier. In fact it fits right into a consultative approach to selling, where we ask tons of questions to understand where our customer is coming from. That includes asking her about color preferences, and letting her talk about what she is looking to achieve in a space. That also means that we become the sounding board rather than the decision maker. 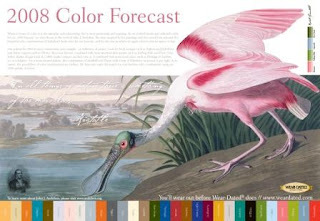 In my presentation, I used the example that Ann Hurley created with our Field Guide To Color forecast. Note on the far right, the four colors? They constitute a palette pulled from this Audubon print. If your customer has no idea how to proceed, suggest to her [or him], that she select a piece of artwork or even fabric that she really likes. From that inspiration, encourage her to pull 4 or 5 or 6 colors. Those become the basis for the color palette to work from. The most livable color [from your customer's perspective] becomes the foundation color. The rest are accents. To suggest ideas in your retail store showroom, consider creating vignettes where you similarly pull colors from a print or fabric. Mix and match textures and surfaces. Add some paint swatches, maybe a few accessories. And, then, change these regularly. I bet you'll be surprised at the conversations you generate with customers, and at how much easier and more fun color is to incorporate in your retail experience. On another note, many thanks to Anthony [Tony] Carroll from Martin Carpet One Floor & Home in Denver, PA for saying that Flooring The Consumer is more relevant to him than Seth Godin's Blog. Heady praise, particularly when combined with an energizing hot Gerber Daisy pink Millennium Nouveau carpet!